New York City will return $5.3m (£4m) to the US government after admitting in a settlement to fraudulently billing damage charges after Hurricane Sandy. Wednesday's settlement states that the city falsely claimed a number of Department of Transportation vehicles were damaged by the 2012 storm. Many of the vehicles had in fact been out of commission long before Sandy. City officials acknowledged they signed off on the claims without actually inspecting the vehicles. US Attorney Geoffrey Berman emphasised the government would always "take decisive enforcement action" to protect the Federal Emergency Management Agency's (Fema) money from "fraud, waste and abuse". "When people lie to Fema about the cause of property damage in order to reap a windfall, it compromises Fema's ability to provide financial assistance to legitimate disaster victims in desperate need." The New York City Department of Transportation (NYCDOT) had obtained the millions of dollars in Fema funds after claiming 132 vehicles were seriously damaged by the 29 October, 2012 storm. 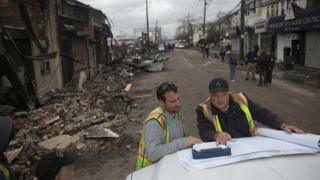 Over a dozen US states were affected by Hurricane Sandy. The total damage costs were $71bn, according to the National Oceanic and Atmospheric Administration (NOAA), making Sandy the fourth costliest hurricane on record. In 2012, New York Governor Andrew Cuomo estimated the state's damage amounted to over $32bn. But according to federal prosecutors, NYCDOT officials "made no effort to inspect the vehicles or otherwise determine whether any reported damage was attributable to Sandy". The claims list included seven paving vehicles that the city had already classified as non-operational - some as early as 2009 - as well as trash equipment taken out of service in 2010. An NYCDOT employee notified the commissioner that some of the vehicles were not actually eligible for Fema funding in June 2014, but the city did not notify the federal agency until the official investigation. "As a result of these false certifications, Fema paid the City millions of dollars to which it was not entitled," the complaint stated. The NYCDOT Deputy Commissioner who signed off on these fake claims "lacked personal knowledge about the vehicles sufficient to make a certification about how and when they were damaged", the government found. The commissioner also "did not personally undertake or direct others to undertake any investigation of the vehicles prior to signing the certification", and the city government failed to review any of the vehicle claims before submitting them to Fema. The city also failed to provide any training to employees responsible for submitting these claims on how the Fema programme worked. New York City will now return the funds it has used via a cash payment of $4.1m, and will not be awarded an additional $1.7m that had been previously approved by Fema. A judge must still approve the settlement. The US Attorney's statement also notes that the city withdrew some $3.1m in other requests during the course of the investigation, acknowledging "the costs were ineligible for reimbursement". Over 100 residents in the New York and New Jersey region have been charged with similar instances of disaster-relief fraud in the years following Hurricane Sandy. Do 'Pray for...' messages make disaster relief harder?